Total alkalinity = 50 ppm; pH = 7.0; Calcium Hardness = 200 ppm & Temperature = 76°F. What is the saturation index value? 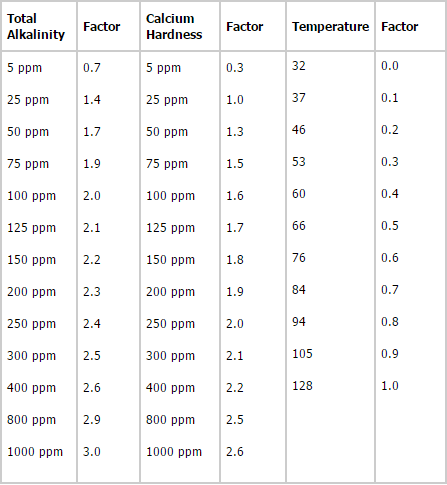 Total alkalinity = 75 ppm; pH = 7.6; Calcium Hardness = 300 ppm & Temperature = 84°F. What is the saturation index value? Total alkalinity = 150 ppm; pH = 8.0; Calcium Hardness = 400 ppm & Temperature = 94°F. What is the saturation index value?